My Baby shoe cake for a baby being welcomed into two heritages. The art of baking cakes is something I am always exploring. I feel like I learn something new everyday, so it just keeps me coming back for more. I remember being in my Grandma's kitchen, watching her bake and being in absolute awe. 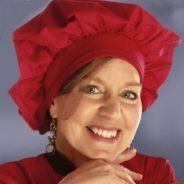 She never used a recipe, and rarely measured anything, however, when those goodies came out of the oven they were the best things I ever tasted. Kids all over the neighborhood knew when Grandma Jeanette was baking and would be at the door within minutes. Today, I can only strive to be the kind of baker and person she was. There is always a moment in the middle of baking where I think of her. So, in a way, she is my inspiration. I like to think if she were here today she would be in awe of me. Baking cakes has changed so much since her and I were in that kitchen. It makes me smile. This cake was for a baby shower in which the baby was being welcomed into two different heritages. After talking to the mom-to-be we decided on the two shoes to represent the cultures. 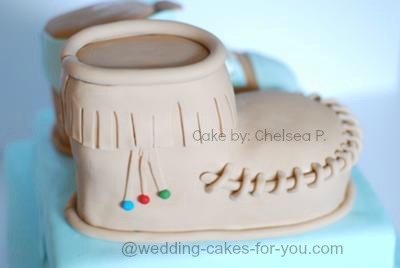 Originally, the cake was to be only the two booties, each one feeding 20 people, that's a big shoe! I felt having the baby booties that big would take away from the little details I had planned, so this is what I came up with....smaller, more detailed footwear on top of a bigger cake. It worked out wonderfully! The details were just that, details, and my favorite part of any cake! The bottom tier was a chocolate cake with cookies and cream filling (which I hadn't made until this cake and am still wondering why because it was delicious!). The middle, single layer tier, and the shoes, were an almond cake with raspberry buttercream. 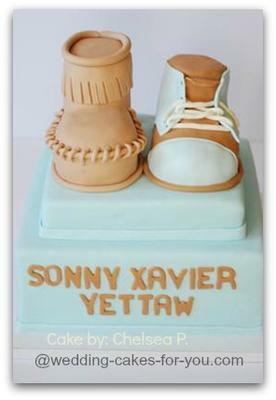 I carved the two shoes out of 2, two layered 6 inch cakes, covered them in fondant and used fondant to detail them. 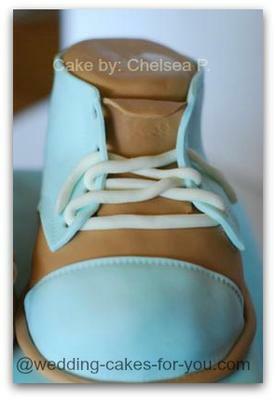 I am very proud of this shoe cake and have showed it off to anyone that I can! I am still starting out, so I still amaze myself at times, and this was one of those times! Chelsea Thank you for a wonderful entry. The cake is amazing and the story is heartfelt. I love grandmother stories. I am sure she would be so proud and in awe of your skills. Good Luck in the cake decorating contest. Cute Chelsea! I saw it on your FB earlier but didn't take a super good look at it til now! Great job! 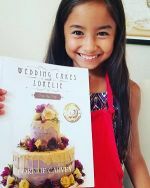 Your story and cake creation are wonderful! I love how clean and neat the shoes are! I think that Chelsea should win this contest, she is so good at what she does and puts soo much effort into her cakes. She made our daughters first birthday cake and people still talk about how great it is.. 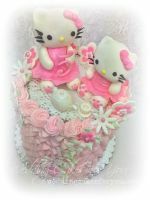 I love this cake cuz not only did she put time into the looks but also the thought before she even began.. Its so wonderful to have someone like her, with all her talent so close to home to make amazing cakes! I just love the detail on the moccasin! It looks real. We used to ask my grandma to buy us a pair of moccasins whenever we'd go to visit her...we just loved them, and this reminds me of it. I have a cake in this contest too, but this cake is just amazing, so I had to vote for it. :) Good luck...I love it! 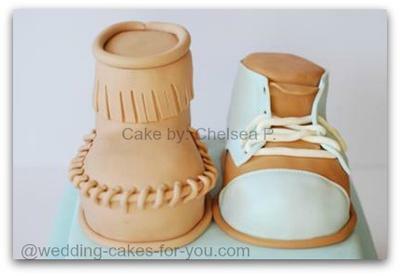 I loved this shoe cake when I first saw it on your Facebook page but now I know the story behind it I love it even more! The shoes are so perfect and the idea of them representing both cultures is lovely! I have never seen anything so adorable and creative!! I have to say I've had some of Chelsea's confections and they are delicious!!! I think we have a winner here!! 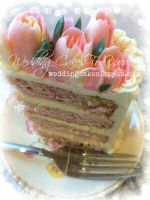 Chels-I love the cake and and your story!! Your "Mema" would be so proud of you!! That little girl who stood by her side, stirring and "helping", is now the young woman making remarkable masterpieces in her own kitchen! I get so excited when I know you are making a new cake and cannot wait to see the final result! I was just in awe when you revealed this cake. So special and memorable!! You deserve to win!! Keep sharing your gift with us!! Cakes are just beautiful to begin with (especially eating them) but when you have such a significant meaning behind it, it makes the cake that much better. Your story is perfect! Chelsea's cakes are absolutely incredible! Each creation is unique, well-planned and, most importantly, delicious! She takes the time to listen to her customers needs and delivers a beautiful cake every time! Amazing cake! What a neat idea to combine cultures in your theme! 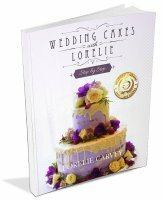 I love looking at your cakes, they are amazing! Keep up the good work! Your cake is so cute, clean lines and all. The shoes are very cute and you came up with a good solution for representing the two cultures. 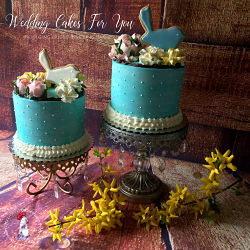 Chelsea's cakes are absolutely amazing, she is making my wedding cake & cupcakes for next year. I've also decided to ask her to do my bridal shower cake also. She is ABSOLUTELY AMAZING, and deserves to win! !